Setting up your Ecommerce Plus template to automatically use USPS shipping is pretty simple as the majority of the the integration has been done for you. Just follow the steps below. You will receive a long email from USPS with information regarding testing the system before going live on the production server. We have already done this step for you so that can be ignored. All that is needed is to follow the instructions for going live on the production server. Now enter your ZIP code. Do be sure to use your 5 digit zip code, not the extended version. This is used in determining shipping costs within the USA. Finally click on the top menu link entitled "Shipping Methods" and select "Edit USPS Shipping Methods"
Select only those that you want to support on your store. The customer will be able to choose the method that they want to use on checkout, only applicable methods will be made available to them. 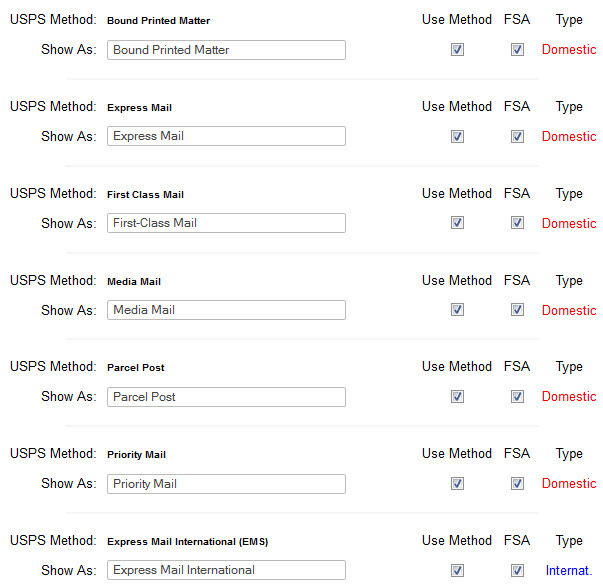 The "FSA" field is provided if you want to offer Free Shipping, which needs to be set up in the discounts admin page. There's no more to it than that really, and as all the integration has already been provided in the software you should be up and running with USPS. All that is left to do is to add the weight of each product as they are added through the product admin section. The shipping cost will then be calculated on checkout depending on the origin, destination and weight of the order. After you apply to the USPS, you will receive an email from them with your username. In this email will be a couple of lines about how to switch your profile to allow you access to the production server. Until you follow this step you will receive an error in checkout about not being authorized on the server. Remember to mention to USPS that the set up is "pre-tested" and you are using Ecommerce Templates. "Invalid XML Element content is invalid according to the DTD/Schema." then make sure you have selected "Pack Products Together" in your main admin settings. USPS has a hard limit of 25 package ratings per request so unfortunately anything over 8 items in the cart exceeds this limit if you are using "Pack Products Separately". Authorization failure. Perhaps username and/or password is incorrect. Congratulations on completing your testing using the U.S. Postal Service's Internet Shipping Application Program Interfaces (APIs). Your profile has been updated to allow you access to the Production Server.